"Judgment Day will be brought upon us only once the Muslims have killed all of the Jews," a quote from the page read. Facebook said the page had begun as a call for peaceful protest, even though it used the term "intifada" with its connotation of violent revolt. "However, after the publicity of the page, more comments deteriorated to direct calls for violence," said Andrew Noyes, Facebook's public policy communications manager. The creators of the page eventually made calls for violence as well, he added. "We monitor pages that are reported to us, and when they degrade to direct calls for violence or expressions of hate - as occurred in this case - we have and will continue to take them down," Mr Noyes said. In a letter last week to Facebook founder Mark Zuckerberg, Israeli Public Diplomacy Minister Yuli Edelstein said the page featured "wild incitement" with calls to kill Jews and talk of "liberating" Jerusalem through violence. "I asked Mr Zuckerberg that the red lines of freedom of expression and incitement and violence should not be crossed," he said. "I welcome that decision even though I am sure that more cat-and-mouse games await us and there will be attempts by our enemies and those who hate us to enter Facebook in other ways." 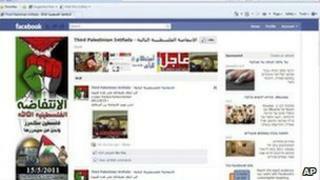 Demetri Deliani, a leading member of the Palestinian party Fatah, mocked Israel's request to remove the page. "It seems that Minister Yuli Edelstein needs lessons in human rights and freedom of expression as he is not aware of the world's respect for individual opinion," he told the official Palestinian news agency Wafa.